David Harp's HarmonicaRobics™ — SuperCharge YourSelf! Here's a video of me and Lola hikin' and harpin' — not really "On Top o' The World," as the old blues tune goes, but on top of a beautiful if low mountain range in Vermont. I'm not a high altitude hiker, so the highest I've ever done my HarmonicaRobics™ is a bit over 14,000 feet (4300 meters). Naturally, the thinner the air, the harder it is to breathe or blow the blues, but HarmonicaRobics™ makes it easier! Did that look like fun? You can learn to play a simplifed version of what I'm playing in the video — without a harmonica! 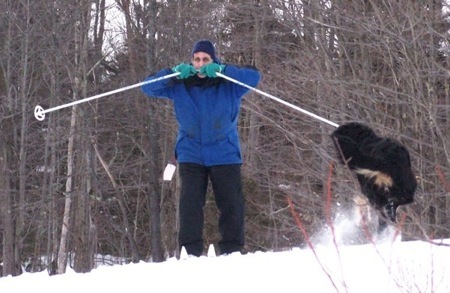 And this can be fun, but Don't Try This Yourself (unless you're a really good skier, and ready to get that harmonica OUT of your mouth if you start to fall)! And I wish I could pirouette on skis like Lola can without 'em!